Almost half my lifetime ago, I left my newspaper editor’s job in cold, wintery Bismarck, N.D., to serve overseas as a Peace Corps volunteer. I ended up in Kenya, in Eastern Africa, where Peace Corps, at my request, trained me to become a water technician. For the first 10 weeks in Kenya, I lived in the central part of the country, attending classes every day, with the greatest focus on cultural and language training. At the end of that time, I was fairly proficient in KiSwahili, the national language. And then Peace Corps, in its wisdom, sent me out to the western part of the country to live and serve among the Luo peoples. I wasn’t in my village but a few days before I realized that the Swahili I had labored so hard to master wasn’t quite the same Swahili the Luos spoke. I had learned classical KiSwahili; the Luos spoke something I later learned was called “dirty Swahili.” The former is highly technical and intricate; the latter is very simple and ignores all rules of grammar. Which meant that my training, which had led me to believe that I could live and move and have my being among the Luo, was insufficient at best, a barrier at worst. All this became crystal clear to me within my first week in my village. Wherever I went, whenever I spoke Swahili, people looked at me in confusion. I couldn’t communicate that well, despite my high score on my language exam. Worst of all, I could not properly greet people. And greeting people, in Africa as in much of the world, is a very important part of life. Whether you greet them … how you greet them … even if you are just walking down the street (or the dirt path, if you live in much of the developing world) … all of those things place you in society. So if you can’t properly greet people, you really don’t have a place … you don’t know where you belong … or even whether you belong. One morning, as I was walking down a dirt road, an old woman – and I mean, an old woman, with frizzy little tufts of grey hair on her head and a face filled with wrinkles and dark, dark eyes that peeked out from between those wrinkles – one morning, this woman greeted me on the road. “I see you,” she said. I was so startled that she spoke to me in English that I didn’t respond at first. I simply while I thought, I see you? What kind of greeting is that? So I responded in kind. “Um, I see you?” I replied, questioningly. The woman smiled at me and stood there and waited for me to go on. “Um, how are you?” I asked, not knowing what else to say. “I am here,” she said. “I am here, too,” I replied, thinking, Isn’t that obvious? We’re standing in the middle of a dirt road, face to face. Of course you’re here. Of course I’m here! “It is good to be seen,” she said. In much of Africa, this greeting is what gives people life and builds community. You don’t walk down the street and ignore people – you see them. And by seeing them, you do more than acknowledge their presence in the same piece of earth that you occupy. You acknowledge their whole being. You grant them meaning. You name them as part of your community. As we parted, she in her direction and I in mine, I realized: I had just been introduced to a whole new way of being. Therefore the other person belonged as well. Yes indeed, it is good to be seen! Seeing and being seen is what today’s Gospel lesson is all about. We have Luke’s story of Zacchaeus, the wee little tax collector who was so anxious to see Jesus that he climbed a sycamore tree in order to see over the people in the crowd. Now most of the time, the focus for this story is on Zaccheus giving away half his fortune and paying back four times what he might owe to people because he had defrauded them. 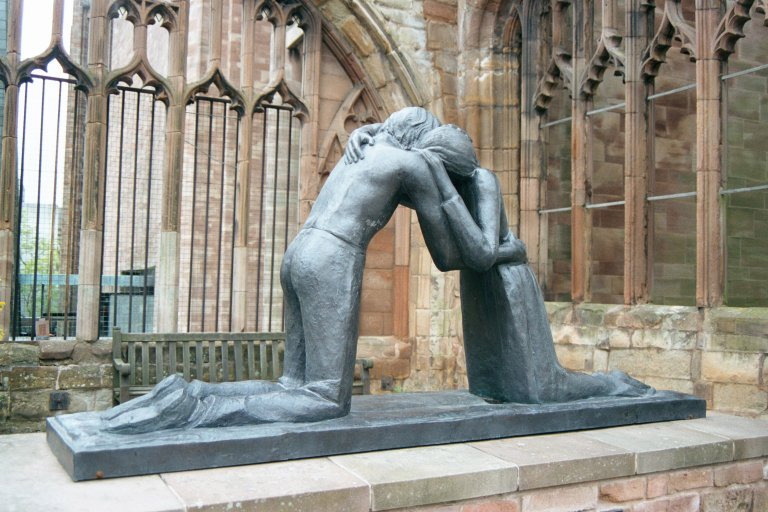 That focus centers on Zaccheus’ conversion and subsequent repentance for the wrongs he had done. But this story is not so much about repentance as it is about inclusion. Or, more accurately, about God’s wild, radical, inexplicable inclusion of all of God’s beloved children, no matter what the world might think of them or how the world might treat them. (c)	Pretty much an outcast in his own society. See (a) and (b) above. So when Jesus calls Zaccheus down from the tree – where he really had no business being, since he was both a grownup and a powerful man – Jesus was setting, yet again, another example of God’s incredible love, even for those whom society does not love. Jesus teaches us, yet again, that God’s love trumps society’s hate. You see, society would have preferred that Jesus ignore that little traitor up in the tree, and society expected the Jesus would never have gone to that little traitor’s house, much less eaten with him. But Jesus never paid much attention to what society wanted, did he? Instead of letting society dictate to him, Jesus dictates to society. He declares who is good, who is worthy. He determines who belongs, who is part of the community. So what if society despises this wee little man? Jesus doesn’t. So what if society has judged this tax collector and found him wanting? Jesus doesn’t. 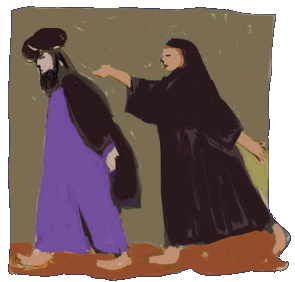 Instead, Jesus declares that Zaccheus is a son of Abraham – a beloved child of God! Jesus saw Zaccheus and declared him good. Jesus demonstrates to and for us an in-your-face, I-really-don’t-care-what-society-thinks radical hospitality that declares, once and for all, that all of us – that each of us – is a beloved child of God. That all of us and each of us belongs to God. That our community is in and with and through God – because God said so! How many times have we declared that someone is not welcome in our community, is not one of “us”? We’ve all done it – we decide that because someone is different, looks different, sounds different, smells different, that he or she cannot come in to our community. And how many times have we been told that we do not belong, that we can’t come in, that we are not welcome in a community? That has happened to all of us as well. But both stances – saying no and being told no – violate the very image of God in which we are created. We are created in God’s image of love, because we are not necessary to God (God was before we were and will be after we are, so we can’t possibly be necessary), and God’s image of community (God the Father, God the Son, God the Holy Spirit, always together). Since God created us in God’s image, God gets to decide who’s in and who’s out. And since God never votes anyone off the island, and God never says, “You I love; you … eh …” we are called to do the same. To include people. … and to be seen. I am here. I see you, Zaccheus replied. I am here. It is good to be seen! Jesus said. Zaccheus’ story is a lesson in community – in God’s community, and how God wants us to be in community. It’s a reminder that we don’t get to make the rules; God does. God sees each and every one of us, welcomes us into the household of God, makes room for us, sits down and eats a meal with us. And then God asks us to do the same. 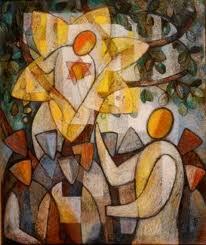 God asks us to see each other not for what we think they are, but for what God knows they are: God’s beloved children. It indeed is good to be seen! A sermon preached at Epiphany Episcopal Church, Richmond, Va., on the 23rd Sunday after Pentecost, 31 October 2010, Proper 26, Year C.
On Friday afternoon, about 4 p.m., Immanuel Chapel at Virginia Theological Seminary burned down. Within minutes, the entire chapel was on fire. Within an hour, it was gone. By nightfall, the walls were all that remained standing – although the fire department warned that they could yet collapse. 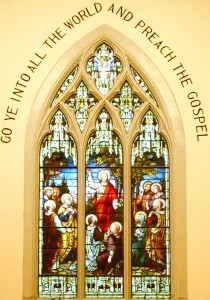 The historic Great Commission window in the VTS chapel, before the fire. Most of the windows, many given by graduating classes, are gone, from the great stained glass depiction behind the altar with the inscription Go Ye Into All the World and Preach the Gospel, which inspired thousands of worshippers and had its Robert E. Lee-look alike St. Peter, to the great Tiffany window of St. Paul testifying in chains. Some windows melted, some exploded. All that is left are jagged openings from which many of us watched water pour as the firefighters fought the two-alarm blaze. On Saturday, we learned that apparently, the six-toed Jesus at the back did survive after all. The altar rail that was sent from Liberia in the late 1800s is gone, as is the altar table and the organ, which seemed to burn for hours. Everything in the sacristy was destroyed, from the patens and chalices and old, time-worn prayerbooks to “Anna Baptist,” the baby doll that thousands of us used to learn how to baptize children. Gone, too, is the pulpit, from which were spoken great soaring sermons meant to inspire us and not-so-great sermons given by preachers who were literally quaking in their boots, and which many of us thought would collapse a few years ago on Martin Luther King Jr. Day when Bishop Michael Curry of North Carolina pounded and swayed and called us yet again to realize the dream not of Dr. King but of our Lord Jesus Christ. Immanuel Chapel, the home in three-year cycles for thousands of seminarians for the past 129 years, the place that nurtured us and then sent us into the world to preach the Gospel, is no more. This is a time for great mourning among the Seminary community. It is a time of great sadness. But already, the community is giving thanks. Thanks that no one was in the chapel at the time and thus no lives were lost. Thanks that none of the dozens of firefighters were injured. Thanks that none of the surrounding buildings were damaged. And yes, thanks that the great cross still towers above the ruins. And already, it is a time for the community to dream. To dream of the new chapel that will rise from those ashes. To dream of better access and better bathrooms. To dream of the unknown possibilities that make up those dreams, and that inspire us to new heights, not just of how to glorify God through our worship, but how to glorify God with our lives. It is as though the prophet Joel were writing this morning just for those of us who loved that Chapel. 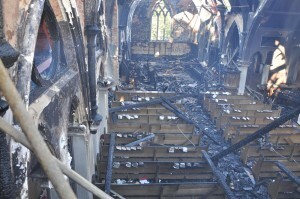 VTS Chapel after the fire. In other words, God says to us through the prophet Joel, despite the calamity of your life, do not lose hope. In other words, God says, do not let the tragedy overcome you. Overcome the tragedy instead, because I the Lord am pouring out my Spirit upon you, because your young are prophesying and seeing visions, and your old are dreaming dreams. Even in the midst of despair – over an economy that will not get its feet back under itself, over wars that are claiming thousands of lives, over injustice and oppression in Sudan and Congo and Zimbabwe, over enduring desperation and a sudden, deadly outbreak of cholera in Haïti, over hatred in the Middle East and oil spills in the Gulf of Mexico, over stubborn unemployment and devastating housing foreclosures – even in the midst of all that can send us plummeting into the pit of despair, we are not to give up. We do not lose hope. Because God’s spirit is pouring over us, and because we are prophesying and dreaming and seeing visions, and therefore, we shall overcome. We shall have new life. That is where God’s Spirit, which is being poured out abundantly over us, leads us: to new life. But only if we live into those prophecies, those dreams, those visions. My friends, let’s be plain here: This is our calling in life. To take the gifts God gives us in the Spirit – the prophecies, the dreams, the visions – and to make them happen. We – who are the beloved children of God – we – who are created in God’s image of love and community – we – who are created to live in love and in community – we are the ones who are especially called to make God’s dreams for us come true. This is not someone else’s call … it is not up to someone else to work on God’s behalf. It is, in fact, why we were created. I need you to know that I am a missionary. For the last five years, I have served as your missionary in both Sudan and Haïti. I have been an Appointed Missionary of the Episcopal Church, which means I represented you and the entire Episcopal Church wherever I went, whomever I served. And because I am a missionary, mission is important to me. But I tend to define “mission” a bit differently than most people, because for me, mission is not simply about going into the world, it is not merely about doing things. For me, “mission” is a way of being. It is how we live our lives as beloved children of God. 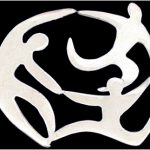 “Mission” encompasses every aspect of our lives, every action we take, every word we speak, even the thoughts we think. Our mission in life is the result of God creating us in God’s image, and declaring us the beloved. You see, when God created the heavens and the earth and the birds of the air and the fishes of the sea and the animals of the land, God brought forth man and woman in God’s very own image. God did so not because God needed us, but because God wanted us. Remember, we are not necessary to God – and we know that, because God was before we were, and God will be after we are, so we can’t possibly be necessary to God. Which means that God loved us into being. So the image of God is that of love. And because we are Trinitarians, believing in the Father, Son and Holy Spirit, always together, never apart, God’s image is that of community. So we are created in love and community to live in love and community. All of which means that each of us is and all of us are God’s beloved children. I’m a beloved child of God. You are a beloved child of God. And you. And you. And you. And you. You are the beloved. We are the beloved. Our mission, therefore, is to love. Not just the people and the things we like. Not just the people and the things we know. But all of God’s creation. As fully, as wildly, as radically, as inexplicably, as eternally as God loves us. We want to make those prophecies and dreams and visions, the ones that come from God and are God’s gift to us … we want all those things to come true? We have to start with love. And we have to always act as God’s beloved. And we have to always remember that everyone else also is God’s beloved. If this is how we live our lives, if we always begin and end in love (no matter how hard that is), when tragedy and calamity hit, we will be fine. Not because we are immune – for we are not. But because we know how to move forward. We know that God loves us, and because God loves us, God gives us the prophecies, the dreams, the visions we need to continue bringing God’s love to the world. God who loved us into being is pouring out God’s Spirit upon us. As the beloved, we have the prophecies, we are dreaming the dreams, we are seeing the visions. Our job, our mission, is to bring those prophecies and dreams and visions to life. To make them happen. God doesn’t give us everything we need so that we can ignore it. God gives us everything we need so that God’s dream for us can come true. That seminary chapel that burned down on Friday? The one where I was formed as a priest, where I learned to baptize (with dear Anna Baptist, that unregenerate baby doll), to celebrate and marry and bury people? It is gone now. But the love that built that place, the love that made it a holy place of God? That love remains. And because the love remains, the community will move forward. A sermon preached on the 22nd Sunday after Pentecost, Proper 25, 24 October 2010, Year C, at Grace Episcopal Church, Goochland, Va.